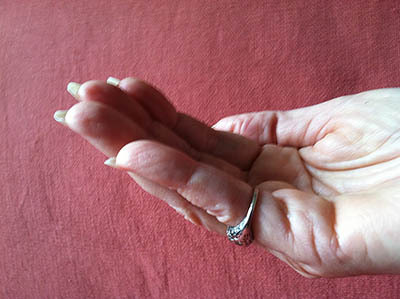 Complete the following: “I reached out my hand again and something was placed in the upturned palm. It was a phrase, ‘Let ________________ go. '” Fill in the blank and write on. Again, use scene and dialogue if you want. (Who gave you the words? Do you know?) 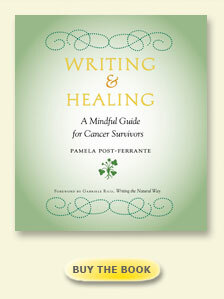 from Session Six, Writing & Healing: A Mindful Guide to Cancer Survivors. The second exercise of Session Six, is similar to the first exercise, in that you receive something—which you will name—to help you learn to take better care of yourself. An upturned palm symbolizes a willingness to learn about yourself. You can do this, even if you don’t have the Meditation CD. Sit quietly and follow your breath “In Out” until you feel you have reached a bit of stillness inside yourself. Then write the sentence above, filling in the blank. This time it was my Granny who came to put the phrase into my palm. I decided to have a dialogue with her using my dominant hand (right) for myself and my non-dominant hand (left) for her. What do you mean “worry”? Thoughts like what would happen if someone you loved died or someone stumbled on their life path and you couldn’t help. I thought it was good to put these feelings into writing. It is or how else would I have known. The thing is you have been worrying about these things for a long time. Or situations like it. Your worry feelings have different actors. It’s good to know what is there, don’t you think? I didn’t know I was worrying. It’s just that worry by itself, what you have been doing, doesn’t get you anywhere. Worry is heavy, darling. It also multiplies. First it is worry about health and before you know it the worry has spread to a dozen other things as well. It’s like a barge of worry being on a waterway controlled by locks. It you open a lock for one and forget to close it barges of worry keep coming. How do I close the lock? Close the lock with other writing. Try gratitude for a few days. Worry will never disappear, just don’t let it take up all the space.